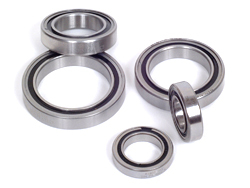 PYC bearing is a specialized manufacturer of bike bearing,bike bearings,bicycle bearings,bicycle bearing. equipment or replacement applications for superior performance in all bicycle types. * With dual-lip labyrinth seals keep dirt out and grease in, even under extreme conditions. * We stock hundreds of standard sizes in multiple levels of quality and price, in many application specific designs. * Substantial price savings over stock bearings. * Ceramic Hybrid bearings with Silicon Nitride balls also available, providing superior smoothness, reduced weight and extended bearing life. * Ceramic offers the absolute cutting edge in extra low resistance full ceramic bearings. For many common applications like hubs and rear-suspension pivots. Available in PYC Standard, and PYC Max Bearings(more balls without retainers). Commonly used in pedals, front hubs, bottom brackets, headsets and certain suspension pivots. Available in PYC Standard, and PYC Max Bearings (more balls without retainers). Commonly used in hubs, bottom brackets and certain suspension pivots. Available in PYC Standard, and PYC Max (more balls without retainers). There are too many applications to honestly keep track of, but here are a few more that we are aware of. 3/8 x 7/8 x 5/16"
3/8 x 1 1/8" x 3/8"